The building of three new patrol ships is expected to start in 2007, and all three ships are expected to be fully fitted and commissioned from 2011-2012. The Naval Material Command, who together with Odense Steel Shipyard Ltd, are responsible for the engineering of the new ships, have lifted a little bit of the veil surrounding these three new patrol ships. As something quite new in the Danish navy, the ships will be fitted with a 32 cell multi missile launcher for several different missiles, among these long range surface-to- air missiles. In connection with the current defence agreement the 2 combat support ships of the ABSALON Class will be followed by 3 new patrol ships to replace the combat capability of the decommissioned WILLEMOES Class torpedo/missile boats and the 3 NIELS JUEL Class corvettes – that will be decommissioned as the new ships go into service. Building of the first of class is expected to begin in 2007, and all 3 ships to be fully fitted out and ready for service by 2011-2012. Latest design draft of the new patrol ships, here seen with the Thales APAR targeting and illumination radar (fore) and the SMART L surveillance and early warning radar (aft). During this current week Naval Material Command, who together with Odense Steel Shipyard Ltd, are responsible for the engineering of the new ships, have lifted a little bit of the veil surrounding the three new patrol ships, that will replace the 3 corvettes of the NIELS JUEL Class, which were commissioned in the beginning of the 1980's. Considering the time frame for the project not all details are in place, and several contract negotiations have not been finished, or even started. Work is still outstanding on a number of alternative possibilities, not least on the electronics field, in particular air and surface radars and fire control radars. It is apparent that the new ships will be build on the same hull as the ABSALON Class, with one deck less, thereby saving in design expense, and building on sea going experience with that hull form. Furthermore the propulsion plant will be the same, except that there will be 4 instead of 2 MTU’s for the 2 propellers – thereby again a saving in training and spares. And experience for the building yard can be carried on in this historical largest and most expensive domestic naval building project. Initial plans for the patrol ships called for a shorter and less beamy hull, but the advantages of using the same hull for both classes must have weighed for, against slightly less steel. So - even if the vail has been lifted, there are still many unanswered questions, and some of the details that have been revealed can leave you puzzled. The new patrol ships will be build to use the Royal Danish Navy's standard flex container system, so that depending of task ahead it is possible to change the various weapon systems by using the flexible container system that originally was developed for the FLYVEFISKEN Class, and since has been used on all new and future ships. Whether the new 35 mm Gun M/04 (CIWS) will be a container weapon remains to be seen. According to Naval Materiel Command it is expected that the ships initially will be fitted with one 76 mm in the A position and one 35 mm in the B position. The ships will however be build for fitting of the 5"/62 (127 mm) Mark 45 Mod 4 as used in the ABSALON Class. The fitting of one 76 mm Super Rapid and one 35 mm CIWS seems to be on the low side compared to the 5"/62 (127 mm) Mark 45 Mod 4 and two 35 mm CIWS in the ABSALON Class. As the patrol ships is apparently meant to be proper combat ships, whereas the ABSALON Class is meant to be combat support ships. Either there is a shortage of funds in the project, or the released information is not entirely complete, as it must be presumed that these new ships, on the same hull as the combat support ships, should have the superior weapons fit of the two, and not look as a "down market" version. The containerization of the new 35 mm CIWS means that the capability reasonably quickly can be added to new combat units, provided that these flex containers are available. The weapons platform will be larger than this shown on the ABSALON Class commands & supports ships, as the platform should also house the Mk41 32-cell multi missile launcher. 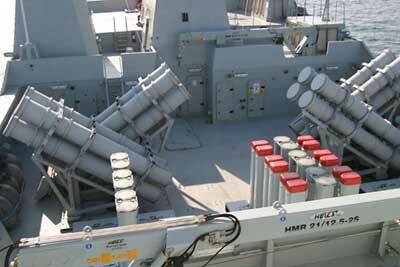 As stated above the new patrol ships are expected to receive at least 8 HARPOON (block II) missiles. These have previously been used in the WILLEMOES Class torpedo/missile boats, the frigates of PEDER SKRAM Class and the corvettes of the NIELS JUEL Class, and units of the FLYVEFISKEN Class, armed as missile boats. The CIWS deals with the area out to 3,5 kilometers from the ship, the Evolved Sea Sparrow deals with the area between 3-18 kilometers. 24 of these ESSM will be fitted on board for close air defence. Additionally as a new feature in the Royal Danish Navy a Mk41 32-cell multi missile launcher for, among other things, long range air defence, will be fitted. Final choice of missile has not been made, but a lot is pointing in the direction of the SM-2 Block III from Raytheon, with a range of 150 kilometers. This system is standard long range air defence in the US-Navy, in the Dutch DE ZEVEN PROVINCIEN Class and the German SACHSEN Class (F124). Looking at the time frame – the 2011-2013 in service date – a development of the SM-2 Block III the SM-6 (ERAM) could be a possibility, with further extended range of approx. 220 km. In practical terms this means that a one single ship of the new class placed right in the southern Kattegat with the right sensors can defend most of the Danish airspace. A solution which can have been decisive for the standing down of the Royal Danish Air Force (RDAF) DeHawk squadrons, and in turn leave the air defence of Denmark with missiles to the navy. The Mk41 multi missile launcher is also capable of firing tactical and strategic Tomahawk cruise missiles – but no decision of purchase of these has been taken. The selection of weapon systems, not least the missile systems, is strongly inter linked with the selection sensor systems. Indications are that if the SM-2 missiles are selected then it is necessary to install the Thales Naval Nederland SMART-L radar system, with a range of 400 kilometers, in lieu of the SMART-S with a range of "only" 250 kilometers, which is the radar system fitted to in the ABSALON Class. Similarly as fire control- and target illumination radar it is probable the Dutch APAR-system will be preferred. Currently work is still outstanding on alternative radar systems, and no contract has yet been signed and delivery date fixed. 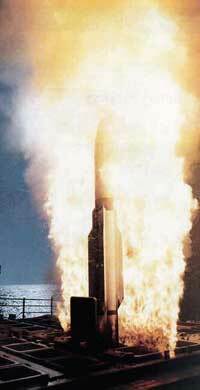 A long range SM-2 Block III SAM is launched from a US navy vessel. 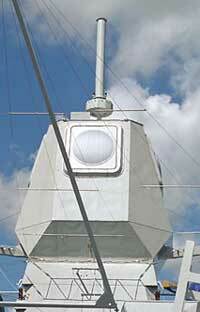 Thales APAR guidance and illumination radar seen here mounted on the Dutch frigate DE ZEVEN PROVINCIEN. 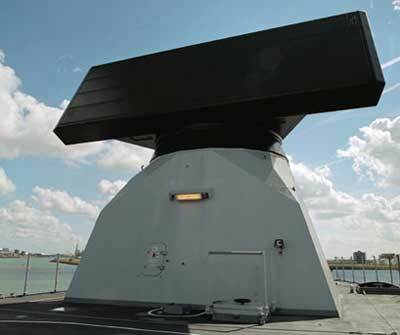 The Thales SMART-L surveillance and early warning radar seen here mounted on the Dutch frigate DE ZEVEN PROVINCIEN, notice the hatch on the front of the antenna mount, just giving an indication of the size. As a first for combat ships in the Royal Danish Navy the patrol ships will have both a helicopter deck and hangar, in order that the ships can embark their own helicopter. The helicopter deck and hangar is big enough for a Agusta-Westland EH101 – currently under procurement for the RDAF as SAR and TTT. In connection with the defence agreement (2004-2009) it has been decided to acquire 4 helicopters in a maritime version for use on the flexible support ships and the new patrol ships. However a contract for these 4 helicopters is still outstanding, but they are expected to be of the same basic design as the 14 EH101 recently delivered to the air force. Additionally space has been allocated for a number of UAV's. The propulsion of the 3 patrol ships will be by the same engines as used in the ABSALON Class, however there will be 4 MTU 20V M70 of 8200 kW each, as opposed to 2 of these engines in the ABSALON Class. This would guarantee a speed of 28 knots. The engines are 2 and 2 connected to reduction gears and will drive 2 controllable pitch propellers of 4,3 meters diameter. There will be a number of generator sets, a bow thruster and fin stabilizers in order to optimize systems and crew working conditions.